The SC's reluctance or inability to hear the challenge to electoral bonds means that the 2019 elections are being fought on dubious funds, write Sanjay Hegde and Pranjal Kishore. 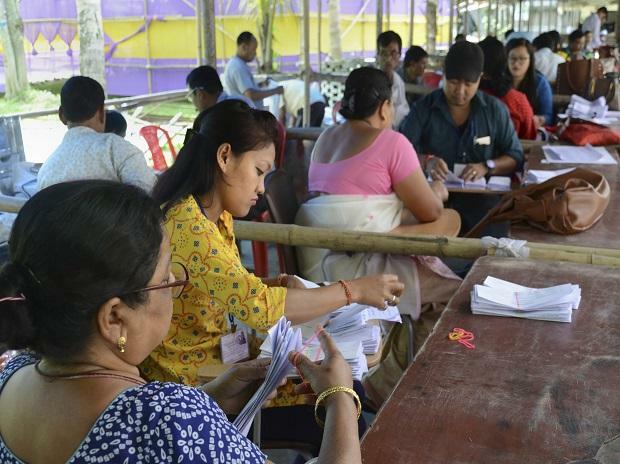 Election officials organise documents, ahead of the first phase of Lok Sabha elections, in Dibrugarh on April 11, 2019. The movie ‘An Insignificant Man’ captures the Aam Aadmi Party’s road to forming the government in Delhi. In one of the scenes, Arvind Kejriwal is shown on the campaign trail. “Humare paas toh power hi nahin hain”(We have no power), he laments. One of the women in the crowd responds – “Hum denge na aapko power” (we will give you power). The exchange captures the very essence of a democratic system—one in which a common citizen can look into the eyes of a chief ministerial candidate and tell him, that his fate depends on her vote. Indian elections are the largest democratic exercise in the world. They are also amongst the most expensive. Researchers from the Centre for Media Studies (CMS) estimated that parties and their candidates spent $2 billion on the 2009 general elections. $5 billion was spent in 2014. The legal regime in India ensures that the sources of this money are hard to identify. The electoral bonds scheme was introduced with a view “cleanse the system of political funding in the country”. An electoral bond is a banking instrument to be used for funding eligible political parties. The bond is sold by the State Bank of India and may be purchased by a person, who is a citizen of India or a company incorporated or established in India. The same is then donated to a political party. The scheme allows for complete anonymity of the donor. Neither the purchaser of the bond nor the political party receiving the donation is mandated to disclose the donor’s identity. However, such data is retained by the State Bank of India. Thus, the Government of the day has access to data regarding donations made. Besides the scheme itself, omnibus changes were made to laws, in order to facilitate funding of political parties. Previously, companies were prohibited from donating more than 7.5% of their average net-profit over the previous three years. This cap has been removed. Thus, even loss-making entities can make unlimited contributions. Additionally, the requirement that a company ought to have been in existence for at least three years before it could make donations has been done away with. This will facilitate the setting up of shell concerns, purely to syphon money into politics. Previously, all subsidiaries of international entities were treated as overseas donors and not allowed to make political contributions. Under the new regime, if a foreign firm has a stake of less than 50 percent in a company operating in India, that unit can fund Indian elections. All of these changes were introduced via a Money Bill – a mechanism which has allowed the government to bypass the Rajya Sabha. The Election Commission has been critical of the scheme and even argued against it in the Supreme Court. A study of legislative changes and judicial pronouncements after 1950 reveals the tension between the two branches of the State with respect to election law. While legislative changes over the years have largely diluted provisions allowing for transparency in the electoral process, constitutional courts have adjudicated in their favour. “….we think it our duty to draw the attention of Parliament to the great danger inherent in permitting companies to make contributions to the funds of political parties. It is a danger which may grow apace and which may ultimately overwhelm and even throttle democracy in this country. Therefore, it is desirable for Parliament to consider under what circumstances and under what limitations companies should be permitted to make these contributions. …. Democracy cannot function unless the voters have all the necessary information about the parties for whom they are going to vote." A similar judgment was passed by the Calcutta High Court in the same year. In two separate judgments passed in 2002 and 2003, the Supreme Court affirmed the right of voters to know the criminal antecedents of candidates, their educational qualifications and their assets and liabilities. It was held that this information was vital for the voter’s right to know the antecedents of the candidates—a right guaranteed under the free speech clause of the Constitution. Electoral bonds were introduced through the Finance Act in 2017 and were challenged before the Supreme Court almost immediately thereafter. The matter was first heard in October, 2017 and has remained pending for over 18 months. In the meanwhile, the court has found the time to hear a plea for the reinvestigation of the murder of Gandhi, frame guidelines for usage of food in Delhi weddings and hear petitions calling for bans on various books/movies. The matter was finally heard for interim orders this week. The Court has not granted any stay against the scheme. However, it has directed all political parties to submit details of the donations received through electoral bonds to the Election Commission in a sealed cover. The court’s reluctance or inability to hear the challenge means that the 2019 general elections are being fought on billions of dollars of dubious funds. This goes to the very heart of Indian democracy. Citizens all over the world want political parties and governments to represent their views and be responsive to their needs. However, all too often parties – and parliaments are disproportionately representative of the interests of the donors who have financed them. If a voter does not know who funds a political party – and is therefore in a position to influence it, the sanctity of the voting process is violated. Democracy abjures secrecy. Political parties revel in it. In all regions of the world there is a deeply worrying trend of money in politics drowning out the voices of ordinary citizens. For a democracy to be healthy, it must revolve, first and foremost, around the citizen. And for a democracy to be sustainable, it requires transparent, accountable and inclusive political parties that can channel the demands of the people and truly represent them.